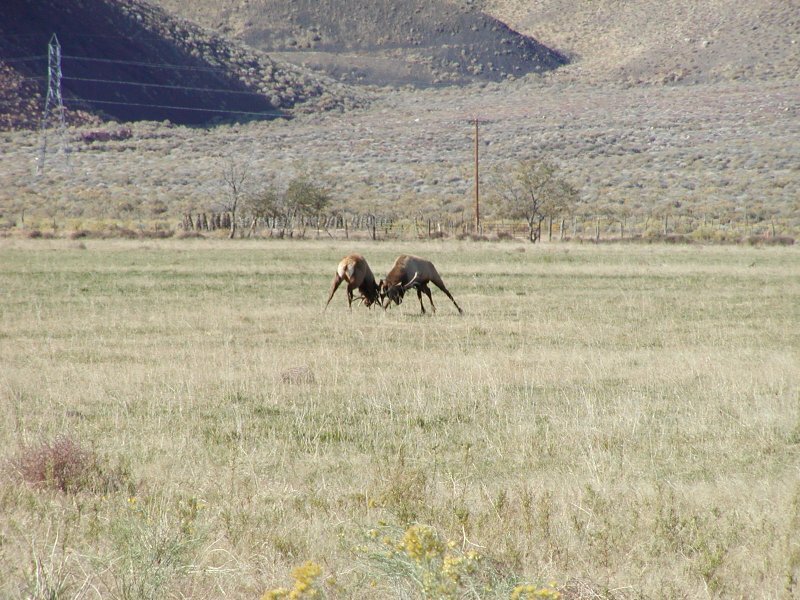 In late October 2005, we saw the Owens Valley elk herd as we often do. But this time the size of the herd was larger than I ever remember seeing before. I suspect the entire valley herd was grouped together in anticipation of the coming winter. This was on an Alfalfa field about 5 miles south of the town of Big Pine, California. 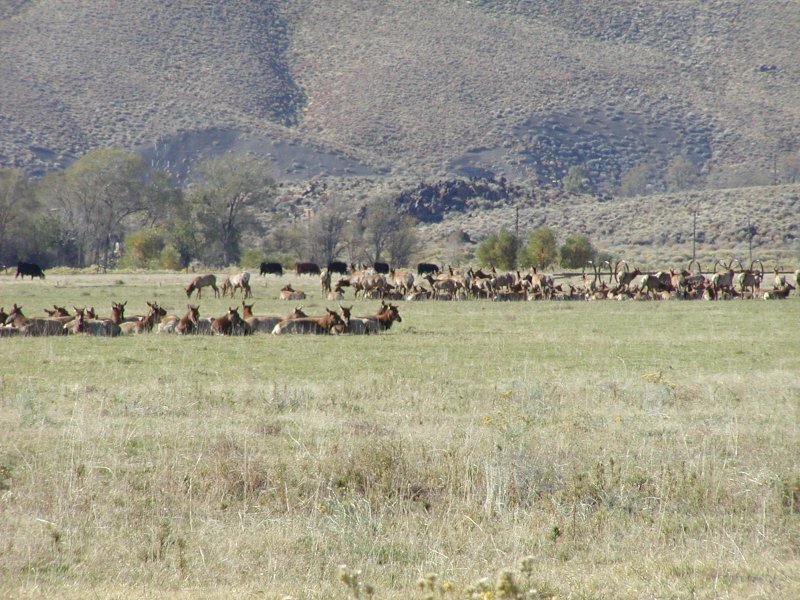 The Owens Valley Elk herd is a popular attraction along U.S. 395, and these photographs were taken from highway turn-outs provided for observation. 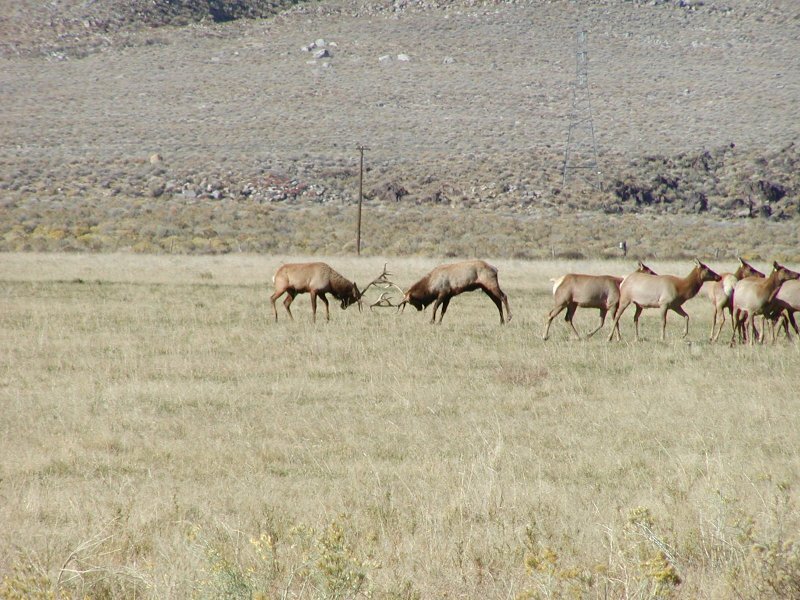 It is very common to see at least some of the Elk herd anywhere along the highway between Lone Pine and Bishop California. The photograph below will give you an idea of the size of the herd. 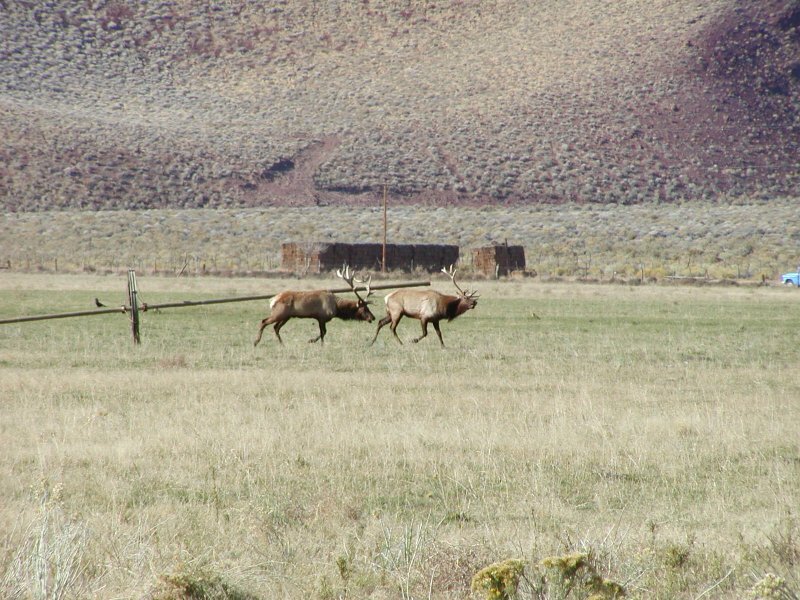 The Elk have no problem sharing the graze with the Cattle you can see in the background. 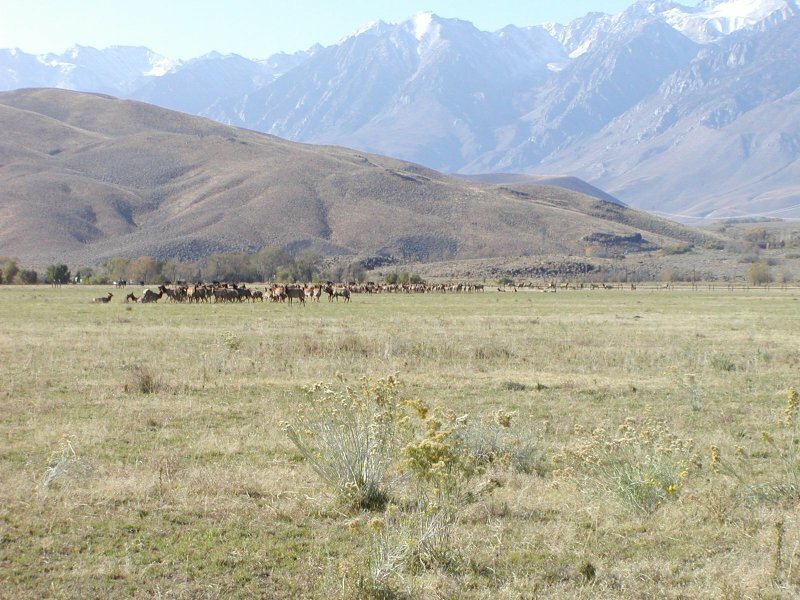 Cattle grazing is one of the dominant industries in the Owens Valley. Tourism is another. About 300 yards from the road a smaller group included two large bulls. While we watched the following fight between two big bulls ensued. We rarely get to see the Elk doing anything besides grazing or bedding down, so the activity was very exciting. I rapidly captured the photographs below of the battle. In this photo you can see the bull on the right has his head down in a sneak attitude and is trying to get between the bigger bull on the left and one of his cows. Below the two begin to rattle horns and make threats. You can also see the group of cows begin moving away toward the North. They've seen this before and know to keep their distance until the argument is settled. 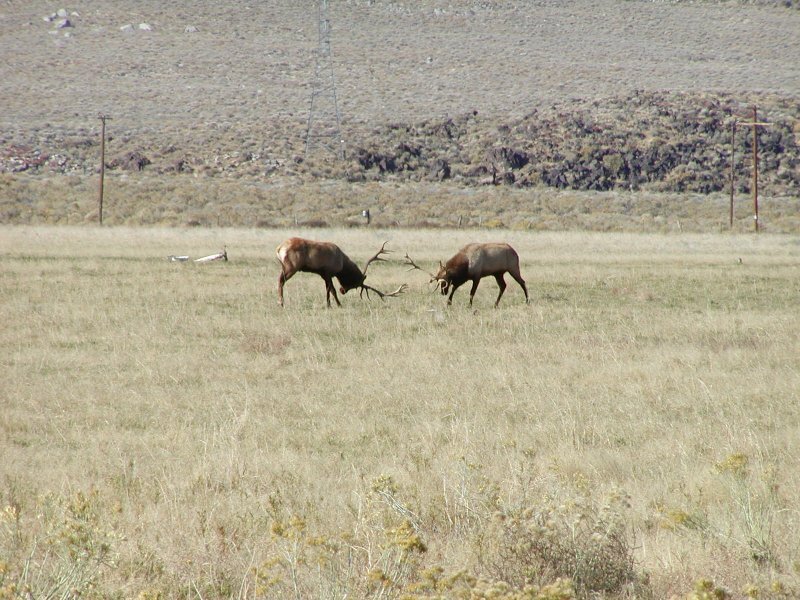 The photograph below shows the size of the antlers on each bull. The body sizes of the two were similar, but the bull on the left below had the advantage in antler size. Another view shows the impressive antler spread! My position has not moved in the photograph below, but you can see that the two bulls have changed their position. In fact they are pushing and pulling each other around a large area of the field. So far most of this has been limited to antler rattling, grunting, and chasing each other around. At one point the smaller bull tries to use a section of irrigation equipment to gain some protection from his opponent. They battled across this pipe for some time, rolling it back and forth with the weight of their bodies. The bigger bull manages to get around the irrigation pipe barrier and has the opponent on the run - for the moment. But the challenger is not giving up yet. He turns suddenly and stands his ground. From 300 yards away we can clearly hear the clatter of the antlers and the huffing and puffing. From this angle you can see the weight is off of their front legs and they are putting their full body mass into the blows. No more threats and bluffs, now it is getting serious. These fights don't generally last long, particularly now when the rut is finished, and in an instant this one was over. This one is over in about 2 minutes, using my camera clock as an estimate, and the winner gathers his cows. A bit of bugling continued while the loser followed along at a more respectful distance. This is a very nice bull Elk! The Owens Valley of California has long been considered a Sportsman's paradise. It stretches north to south along the Eastern divide of the Sierra mountain range. Bounded on the west by the 14,000 ft peaks of the Sierra, on the east by the White mountains and to the south by the Mojave desert. 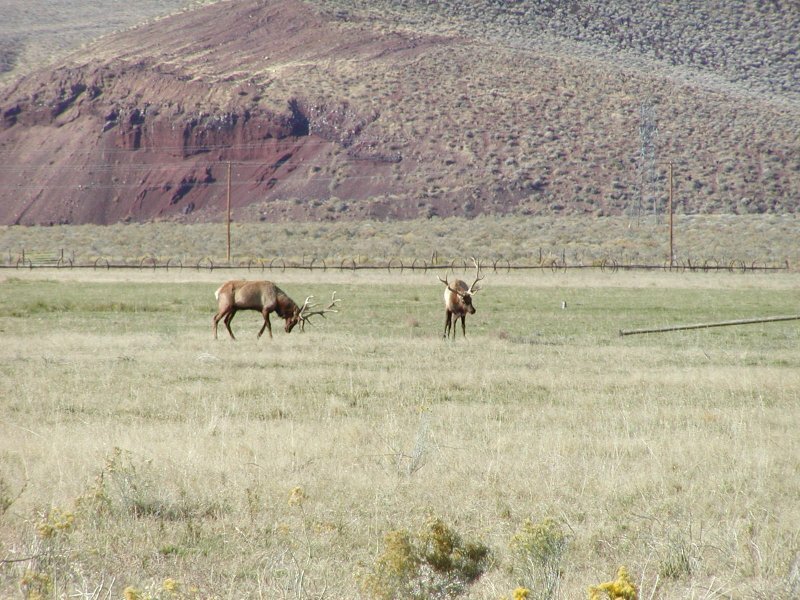 The Tule Elk found here are a smaller species than the more common Rock Mountain Elk or Roosevelt Elk, with adult males weighing as much as 700 pounds. 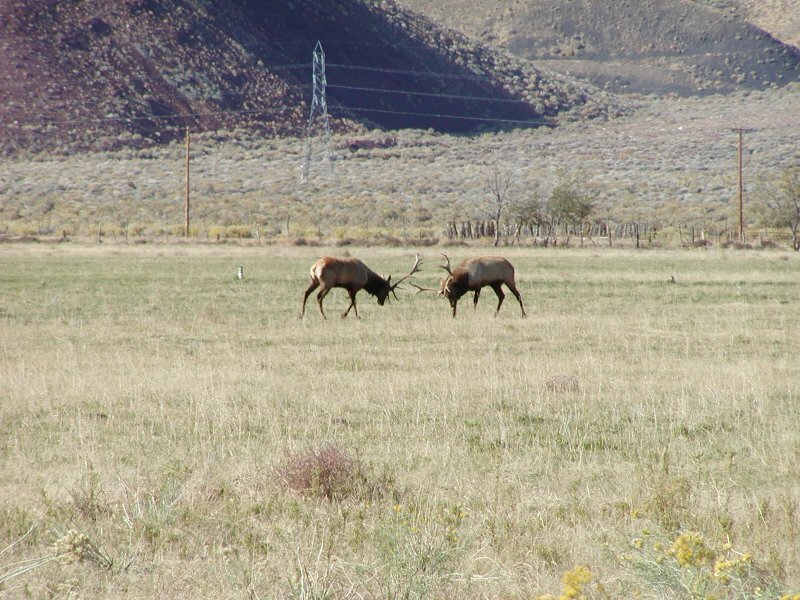 The Tule Elk are not native to the Owens Valley, but are native to the valleys to the west of the Sierra, including primarily the San Joaquin Valley and westward to the Pacific Ocean. Primarily an inhabitant of open valleys, the peaks of the Sierra were a barrier to eastward migration. The important agricultural development of the San Joaquin Valley put the Tule Elk species at risk. 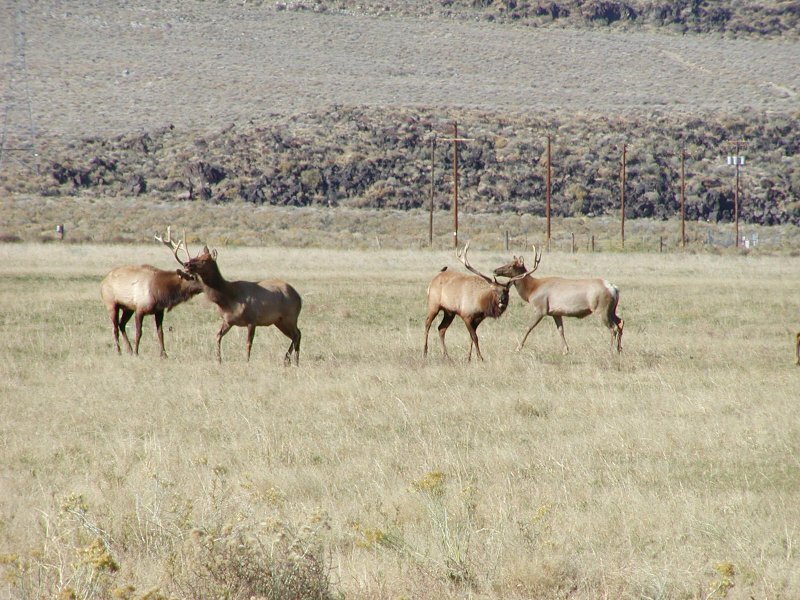 While the Rocky Mountain Elk prefers the habitat of the highest mountain slopes where few people live or work, the Tule Elk habitat is at direct conflict with the interests of humans in California. Although protections were enacted in the late 1800's, the real problem of suitable habitat remains. 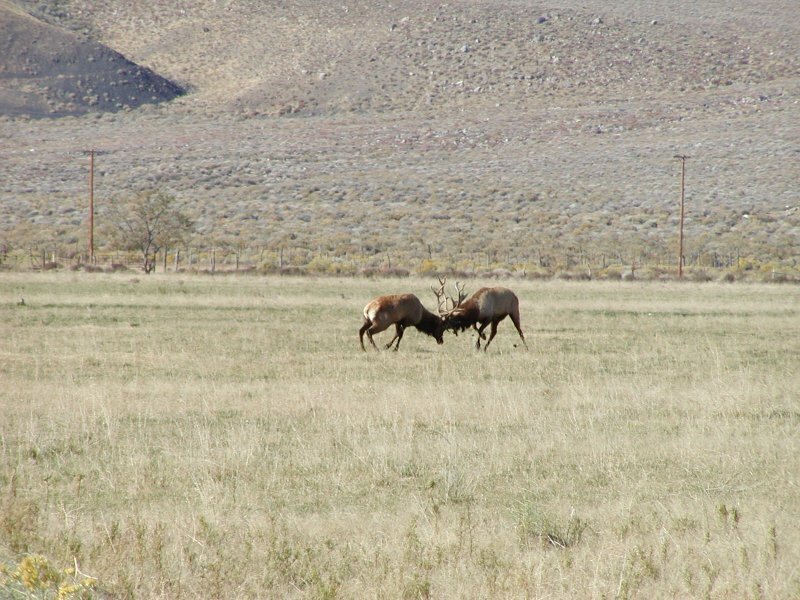 Tule Elk were introduced into the Owens Valley in 1934 to help provide a habitat suitable for the protection of the species. 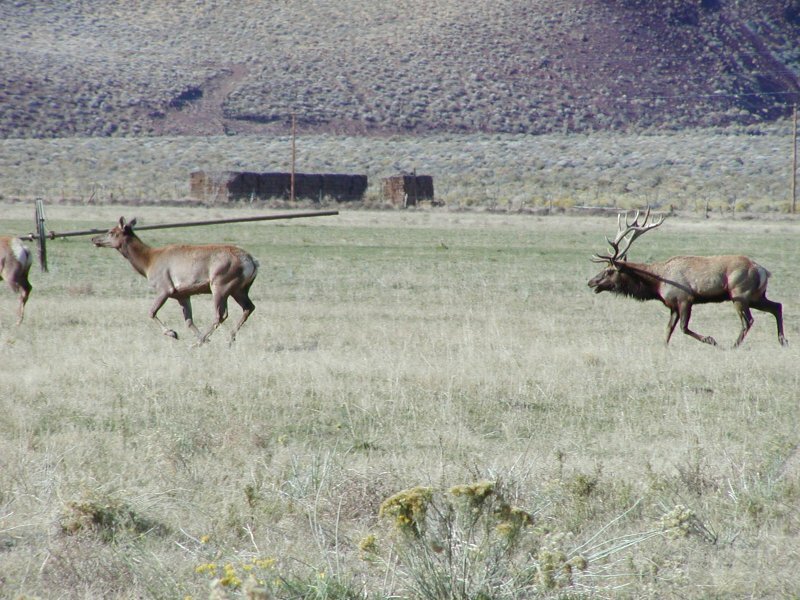 The Elk have thrived in the Owens Valley to the point that limited hunting opportunities provided by the CA DFG. 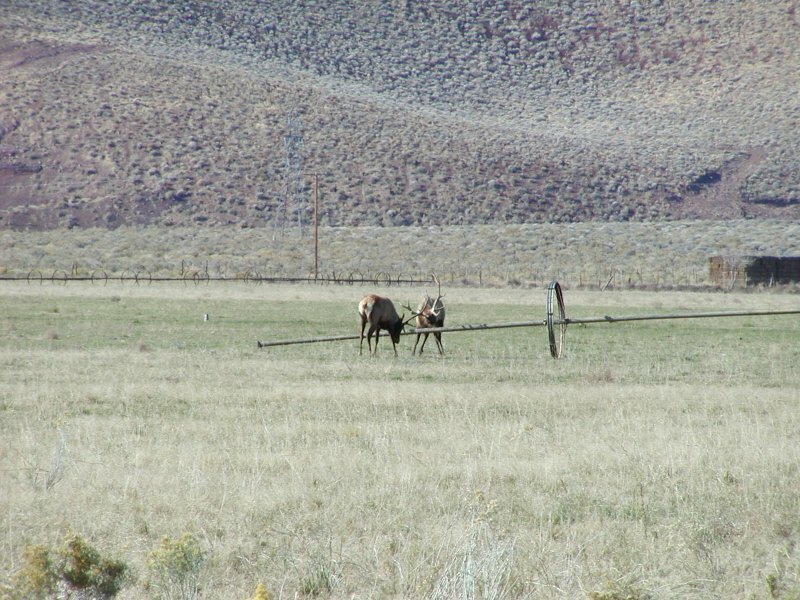 The Owens Valley Elk can be observed anywhere along U.S. Highway 395 from approximately the town of Olancha in the south, to as far north as the town of Bishop. Your chances will be improved if you watch for the "ELK" signs provided by Caltrans. I have rarely seen a few Elk to the east of the highway in the Sage brush, but by far the most common viewing opportunities will be on the Alfalfa fields on the west side of the highway. These fields are scattered between points just north of the town of Lone Pine to just south of the town of Big Pine.